Gothic Instruments have released a patch update v1.1 to their Dronar titles; Hybrid Module and Guitarscapes. This is a free update, included by default with any new purchase. Existing users would have additionally been emailed direct access to the patch update files. 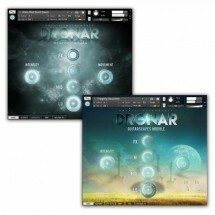 The new Instruments will only work with Kontakt 5.6 and above. The previous legacy Instruments will only work with Kontakt 5.5. Therefore existing users should keep both in case you want to switch between Kontakt 5.6 and 5.5. for some reason. This update is a workaround for a bug introduced by the Kontakt 5.6 and 5.6.1 updates. There are no additional preset contents within this update. This update raises the minimum system requirements to the full Kontakt 5.6 or higher. Users looking to obtain the legacy patch files for use with Kontakt 5.5 should get in touch.